I've Got A Sample For You! The other day my office neighbour, she has the space next door to us, popped her head 'round the door saying 'I've got a sample for you' as she handed me this bottle. You should have seen the look on the interns face! 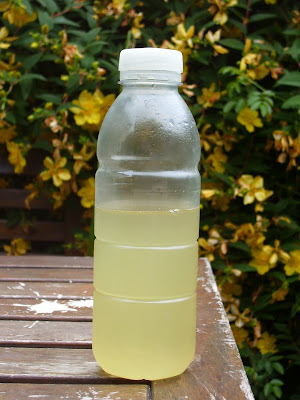 Of course it's Elderflower cordial, and so delicious even the kids liked it! The elder flowers in our garden have all gone now, roll on the elderberries! Any elderberry recipe ideas gratefully received!